There is finally a cure for those suffering cabin fever. Bingo Cabin is the answer and gives a spark to your day. You may still have a fever, but it will be one that turns the heat up in excitement. Bingo Cabin is the cure-all for the doldrums. A cozy cabin nestled in snow-capped mountains and evergreens is a reminder of how sweet it is to be home. The glow from inside isn’t coming from the warm fire; rather it’s the radiance of Bingo Cabin on your computer monitor. Bingo Cabin reminds us how wonderful it truly is to play from the comfort of our homes. The bingo community touches the lives of those throughout the world in a way that has never been done before thanks to online bingo. Bingo Cabin has it all and is a bingo crowd pleaser with Mega Bingo, Free Bingo and interactive Competitions. Registration is made easy with no annoying credit cards required to join. Leap Frog Gaming software lead Bingo Cabin into a high profile bingo site that grabs the attention of players around the online bingo world. The user friendly navigation and features make this a favorite for many. 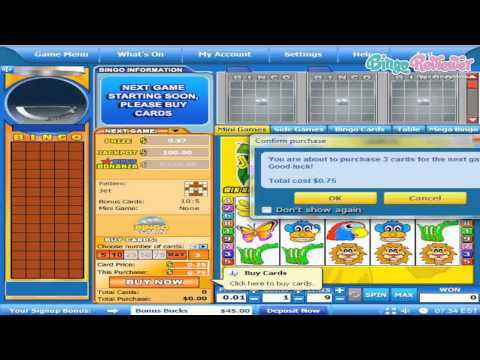 Bingo Cabin is accessed through a quick and easy download platform. Licensed in Netherlands Antilles, the site stays within the guidelines and operates under ethical business practice. 75 ball bingo is the only variety offered but Mega Bingo more than makes up for it. You are probably wondering what Mega Bingo is and as the name suggests it’s about Mega Jackpots. This network game has guaranteed jackpots with up to 10k up for grabs every game. The Mega jackpot reaches the six figure mark to the lucky winner. The bingo room offers a wide variety of games to choose from with tabs for Slots, Pull Tabs and Instant Games. In addition to the regular prizes there is the Jackpot and the Bingo Bonanza Jackpot in Bingo 75 Rooms. Two hours of Free Bingo is available each and every day where cash is given away. Depending on your VIP status schedules vary. A host of Slots are offered with 3 reel and 5 reel Progressive Jackpots. The entertainment value isn't stopped there with Casino and Instant Games offered for a full online gaming advantage, housed under one cabin, the Bingo Cabin. Bingo Cabin is warming up your house with a Sign-up offer for free bonus bucks. Winnings from the bingo bucks are applied only after making your first deposit and will go towards your cash balance. A First Time Deposit Bonus is available after registration to all new players and will be distributed in the form of Bonus Bucks. Bonus Bucks can only be played on bingo games and any winnings will be added to your cash balance. Reload Bonuses are available to all depositing players. Do you have a competitive streak? If so make sure to check out the Tourneys and Competitions where great prizes are awarded to the top winners. Suggest your bingo friends to Bingo Cabin and not only will you be rewarded when they join and make their first deposit, but get credit for merely making the recommendation too. Ample jackpots including Mega Bingo Jackpots, Bingo Bonanza Jackpots and Progressive Jackpots makes players feel like they have won the Jackpot for discovering Bingo Cabin. We rate this site with 3.75 Pinks Stars. I can't imagine a nicer place to be than in my cabin in the woods, snuggling up next to the warm glow of my computer, while playing several games of my favorite, Bingo. Bingo Cabin has all this and more to offer though US citizens are not allowed to participate. I usually don't like to have to download a site in order to play as there are so many that run right in my browser, but it looks like with the Leap Frog Gaming software, downloading is the way you have to go. At least once downloaded the games are easy to access and the play is great. With the 30 bbs you get for signing up, you get lots of playtime and can use the bbs to explore all the different games, or concentrate on one and try to win big. It's fun to be able to create and design your own character to identify yourself as you play. It's also great to see that Bingo Cabin offers a lot of free games to play so that their members aren't out in the cold when they run out of cash to spend. It would be great if they would make their games available to more than just windows pc based devices. Perhaps with all of the other sites that let you use your mac, phone, ipad, etc..., Bingo Cabin will modernize a little more and bring in these other playing platforms. Leapfrog sites are usually very simplistic in design, which is something I did expect, since it's a download and play variant, and you will probably spend very little time on the site itself. That, however, doesn't mean that it couldn't be a bit more attractive, specially if you have a higher resolution screen. Also, didn't quite appreciate the pop-up fake chat window with various offers. I like to get to know the site better and then decide the way I want to go. At this time, there is a $30 no deposit bonus waiting for new players, with a 3xB&D WR, which is not all that bad. There are 5 bingo rooms (75 ball and 90 ball games) and a total of 33 slots available, which should be enough for most of the people out there, but if you are looking for a a bigger game variety, you will probably look further.